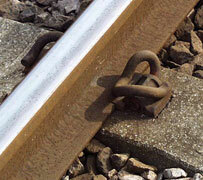 on concrete sleeper. 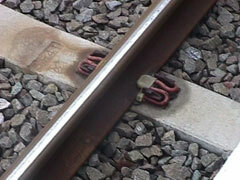 Pandrol clip with cast baseplate on timber sleeper. 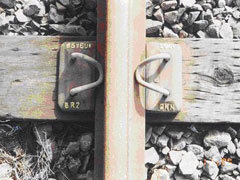 Mills Clip, Pandrol Clip and SHC Clip, (these photographs are copyright of the Devils Guide). 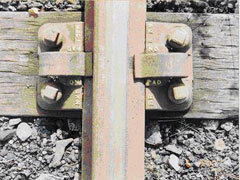 BR1 baseplate for use with FB rail fitted with elastic spikes. BR2 baseplate with Macbeth spikes. 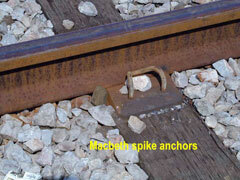 BR1 baseplate wrongly fitted with Macbeth spikes. 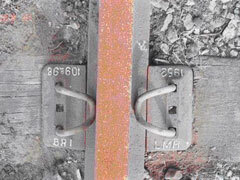 Very early 'BR1' baseplate marked for use with the original 113lb FB rail section. 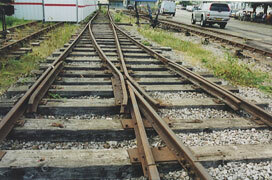 Early type Mills baseplate. 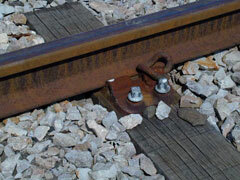 Standard Mills CR3 baseplate. 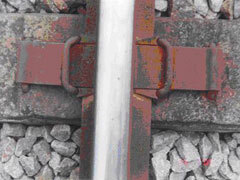 BJB clips on an F10 concrete sleeper, this is a rather tired example fitted with a pad designed for a Pandrol fitted F27 sleeper. 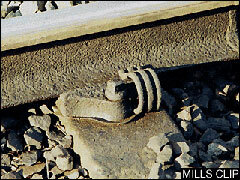 The two arms of the clip would also have been fitted with insulating sleeves when it was new. 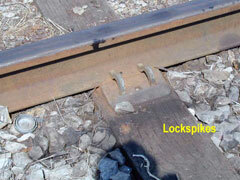 On curves the flat plate under the clip sometimes broke out the concrete on the rear side of the locating groove. 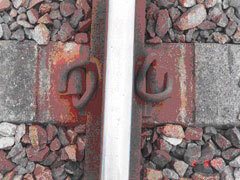 So some sleepers were retro-fitted with much wider plates. 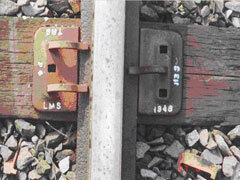 F10 sleeper converted to use Pandrol fastenings by epoxy gluing the housings into the hole originally used by the BJB screw and its insert plug. 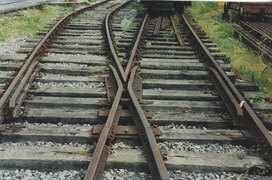 This was done both on site and in shops, site sleepers are sometimes seen converted on one side only. 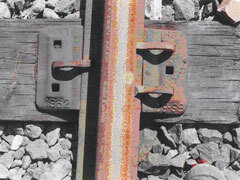 F19 SHC sleeper with the original square clips, there is a later version called a fish or swallow tail where the outer end of the clip tapers to a point. 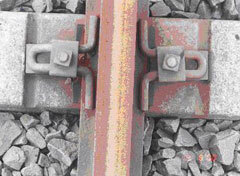 The end resting on the rail having two matching prongs. 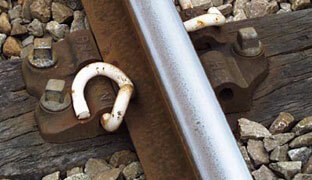 This saved metal and cost but made the clips very difficult to remove. 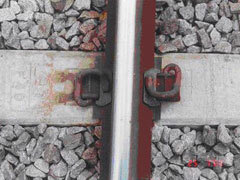 NRS1 baseplate will take both 113A and UIC60 rail the size difference being taken up by the nylons. 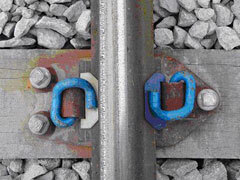 Use two F40 style GR nylons for UIC 60, or red and yellow nylons (originally blue and white were used) for 113A section rail. 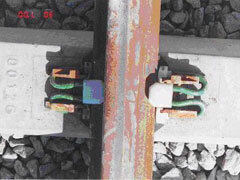 With both rail sections type e 2007 Pandrol clips are used. 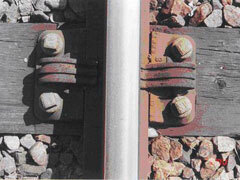 Note texture on railhead left by rail grinding machine.